Draupadi and her five husbands, the Pandavas. Top down, from left to right: the twins Nakula and Sahadeva stand either side of the throne on which Yudhishthira and Draupadi sit between Bhima and Arjuna. Polyandry in India refers to the practice of polyandry, whereby a woman has two or more husbands at the same time, either historically on the Indian subcontinent or currently in the country of India. 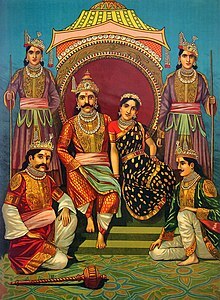 An early example can be found in the Hindu epic Mahabharata, in which Draupadi, daughter of the king of Panchala, is married to five brothers. Polyandry was mainly prevalent in the Kinnaur Region, a part of Himachal in India which is close to the Tibet or currently the Indo-China border. As mentioned in the epic Mahabharata, the Pandavas were banished from their kingdom for thirteen years and they spent the last year hiding in this hilly terrain of Kinnaur. A minority of the Kinaauris still claim to be descendants of the Pandavas and thus justify the practice of polyandry. However, this is a debatable issue as Kinnauris existed long before the Pandavas as mentioned in the epic. 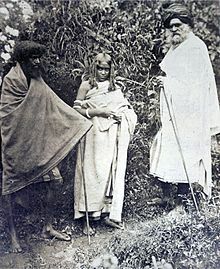 Apart from Kinnaur, polyandry was practised in South India among the Todas tribes of Nilgiris, Nanjanad Vellala of Travancore. and some Nair castes. While polyandrous unions have disappeared from the traditions of many of the groups and tribes, it is still practiced by some Paharis, especially in the Jaunsar-Bawar region in Northern India. Recent years have seen the rise in fraternal polyandry in the agrarian societies in Malwa region of Punjab to avoid division of farming land. Polyandry is in practice in many villages of Kinnaur district of Himachal Pradesh. Fraternal polyandry (where husbands are related to each other) is mainly in practice in villages, where the societies are male dominated and which still follow ancient rituals and customs. There are many forms of polyandry which can be found here. Most often, all the brothers are married to a woman and sometimes the marriage to brothers happens at a later date. The wife can only ascertain the blood-relationship of the children, though recently there have been a few instances of paternity tests using DNA samples to resolve inheritance disputes. The rules for breaking the marriage are strict and a brother going against the marriage agreement can be treated as an outcast while losing his entire share in the property. Todas are tribal people residing in the Nilgiri hills in South India who for several centuries practiced polyandry. They practiced a form of polyandrous relationship which is considered to be a classic example of polyandry. They practiced both fraternal and sequential polyandry. Polyandry and polygamy were prevalent in Kerala till the late 19th century and isolated cases were reported till the mid-20th century. Castes practicing polyandry were Nairs, Kammalans and a few of the artisan castes. In the case of Nairs and other related castes, a man's property is inherited by his sister's children and not his own. Under Nair polyandry, the only conceivable blood-relationship could be ascertained through females. However, polyandry among Nairs is a contested issue with opinion divided between ones who support its existence and ones who do not support it based on the fact that no stable conjugal relationship is formed in Nair polyandry. Polyandry was practised in Jaunsar-Bawar in Uttarakhand. A distinct group of people called Paharis live in the lower ranges of Himalayas in Northern India from southeastern Kashmir all the way through Nepal. Polyandry has been reported among these people in many districts but studied in great detail in Jaunsar-Bawar. It is a region in Dehradun district in Uttarakhand. The practice is believed to have descended from their ancestors who had earlier settled down in the plains from Himalayas. Polyandrous union occurs in this region when a woman marries the eldest son in a family. The woman automatically becomes the wife of all his brothers upon her marriage. The brothers can be married to more than one woman if the first woman was sterile or if the age difference of the brothers were large. The wife is shared equally by all brothers and no one in the group has exclusive privilege to the wife. The woman considers all the men in the group her husband and the children recognise them all as their father. Fraternal polyandry exists among the Khasa of Dehradun; and among the Gallong and Memba of Arunachal Pradesh, the Mala Madessar, the Mavilan, etc. of Kerala. Non-fraternal polyandry exists among the Kota; and among the Karvazhi, Pulaya, Muthuvan, and Mannan in Kerala. In the 1911 Census of India, E.A. Gait mentions polyandry of the Tibetans, Bhotias, Kanets of Kulu valley, people of state of Bashahr, Thakkars and Megs of Kashmir, Gonds of Central Provinces, Todas and Kurumbas of Nilgiris, Kallars of Madurai, Tolkolans of Malabar, Ishavans, Kaniyans and Kammalans of Cochin, Muduvas of Travancore and of Nairs. ^ Samuelson, James (1890). India, Past and Present, Historical, Social, and Political. London: Trübner & Co. pp. 18, 20, 46, 47. Retrieved 6 September 2018 – via Internet Archive. ^ Lakshmi Raghunandan. At the Turn of the Tide: The Life and Times of Maharani Setu Lakshmi Bayi, the Last Queen of Travancore, 1995. p. 185. ^ "Draupadis bloom in rural Punjab" The Times of India. 16 July 2005. ^ Anthony R Walker (28 February – 12 March 2004). "The truth about the Todas". Frontline. 21 (5). Archived from the original on 13 October 2007. ^ Austin L. Hughes (14 July 1988). Evolution and Human Kinship. OUP USA. p. 101. ISBN 978-0-19-505234-3. ^ Bron B. Ingoldsby and Suzanna D. Smith (7 September 2005). Families in Global and Multicultural Perspective. Sage Publications, Inc. p. 104. ISBN 978-0-7619-2819-5. ^ The Todas by William Halse Rivers Rivers. ^ A Study of Polyandry – Prince Peter of Greece and Denmark (1963) The Hague: Moulton. Open Library ID OL15135517M. p. 159. ^ Polyandry in India: Demographic, economic, social, religious, and psychological concomitants of plural marriages in women - Manis Kumar Raha and Palash Chandra Coomar (1987) Gian Pub. House. ISBN 81-212-0105-5. p. 432. ^ The imperial gazetteer of India by William Wilson Hunter. ^ H. W. H. (12 February 1886). "Primitive Marriage". Science. American Association for the Advancement of Science. 7 (158): 147–149. doi:10.1126/science.ns-7.158S.147. JSTOR 1760231. PMID 17759687. ^ A. Aiyappan (March 1932). "Nayar Polyandry". Man. Royal Anthropological Institute of Great Britain and Ireland. 32: 78–79. JSTOR 2790087. ^ L. K. Ananthakrishna Iyer (November 1932). "Nayar Polyandry". Man. Royal Anthropological Institute of Great Britain and Ireland. 32: 269–270. JSTOR 2790609. ^ Opler, Marvin K. (September 1943). "Woman's Social Status and the Forms of Marriage". American Journal of Sociology. University of Chicago Press. 49 (2): 125–148. doi:10.1086/219347. JSTOR 2770359. ^ "The mystique of the mountains". Frontline. November–December 2003. ^ Miriam Koktvedgaard Zeitzen (5 August 2008). Polygamy: A Cross-Cultural Analysis. Berg Publishers. p. 109. ISBN 978-1-84520-221-7. ^ Berreman, Gerald D. (1962). "Pahari Polyandry: A Comparison". American Anthropologist. 64 (1): 60–75. doi:10.1525/aa.1962.64.1.02a00070. ^ Berreman, Gerald D. (February 1975). "Himalayan Polyandry and the Domestic Cycle". American Ethnologist. Blackwell Publishing, on behalf of the American Anthropological Association. 2 (1): 127–138. doi:10.1525/ae.1975.2.1.02a00070. JSTOR 643539. Manis Kumar Raha & Palash Chandra Coomar : Polyandry in India. Gian Publishing House, Delhi, 1987.